What's the secret to making a smart choice for your heating or cooling needs? City Suburban and our "P.O.M.G. ", Peace of Mind Guaranteed. 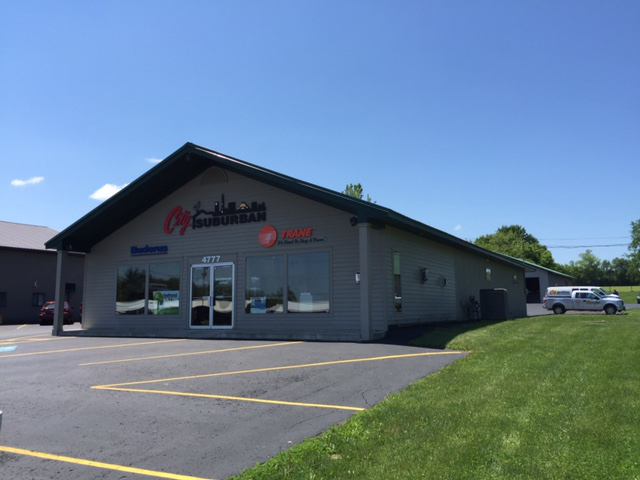 City Suburban Heating & Air Conditioning provides high quality service for heating systems in the Central New York area. City Suburban is locally owned and operated by Joseph Isgro since 1982, and Joe's daughter and son-in-law, Jennifer and Kristopher Morrissette, have been managing City Suburban since 2005. Our expert installation crews have years of experience analyzing, recommending and installing gas and oil heating and furnace systems, cooling systems, and air quality accessories. Visit our comfortable, contemporary showroom to see many of our units on display and speak to a knowledgeable City Suburban representative. Make an appointment with City Suburban, and we show up on time. We provide fast, reliable service, give you a FREE accurate estimate, explain everything before work begins, and get it done with a minimum of inconvenience. City Suburban crews are experienced, available 24 hours a day, 7 days a week, and deliver exceptional customer service. We stand behind every installation, start to finish. Our new, high-efficiency systems from industry leaders will save you money, operate more quietly, and require less maintenance. Explore and learn more about how City Suburban can give you P.O.M.G.